Hello, my name is Louis Bever. I am typing this in my boxers and drinking the worst coffee that I have ever made. It's just muddy water but it's full of caffeine and I am more tired than a Moroccan Mule. My stomach sounds like my pet cat Rocco when the fella hasn't been fed for 3 hours. Constant growling. I don't really know how to introduce myself properly. "Hey, I'm an incredibly talented photographer but also horrendously modest!". Yeah, no way. Trying to explain my upbringing to people is really confusing. It usually takes about 15 minutes and the person I am explaining it to is still confused. I was born in Germany, moved around for 21 years across Europe. I spent most of my life in France, Germany and Italy. As much as I used to moan to my Dad about chucking me into French schools and international schools when I couldn't speak a word of French or Italian, I appreciate it now. I studied law at University and managed to graduate with a 2.1 and I currently work in a law firm doing family law which is really intriguing work. However I was thrown into Photography and Skateboarding by my parents who have been the most supportive people throughout my teenage years. I use photography as a way to relax and just take pictures of what I want. I'm not a professional photographer and I have never studied it. I am just obsessed with the concept of it. It's amazing how you can just stand there and look at a moment and capture it through a camera. It baffles me. I zone out quite a bit when I see something I like and photography just gives me an excuse to be able to actually zone out and take a picture of it. My mind works at 100mph and I am constantly thinking of photography ideas. Some have failed and some have been a success. An idea can grow on me like a cyst and the only way to get rid of it is surgically remove it. Growing up around the military has been fantastic. You can instantly tell if someone has been an 'army brat' as the American call us because they can just speak to anyone. So I spent most of my childhood making new friends every 2 years and this has been significant in the way I shoot. I will just speak to anybody from any background. Every project I have ever done from Skateboarding to Fashion, I have always ended up becoming very good friends with the people I have worked with. It's great fun. Also meeting people from different cultures makes it easier not to judge someone by the way the look. It's made me really open-minded. I have just got back from Morocco. I am sunburnt, knackered and and my bank account is weeping but I had the greatest trip. I managed to shoot 9 rolls of film. I don't shoot digital anymore. I had a bit of a creative block 3 years ago and sacked off the modern way of taking pictures. I haven't looked back since to be honest. I have a Contax G2 and a Leica M6. I did have a Contax T2 but it got robbed in the metro in Paris. Her name was Poppy and I'll never see her again. RIP Poppy. 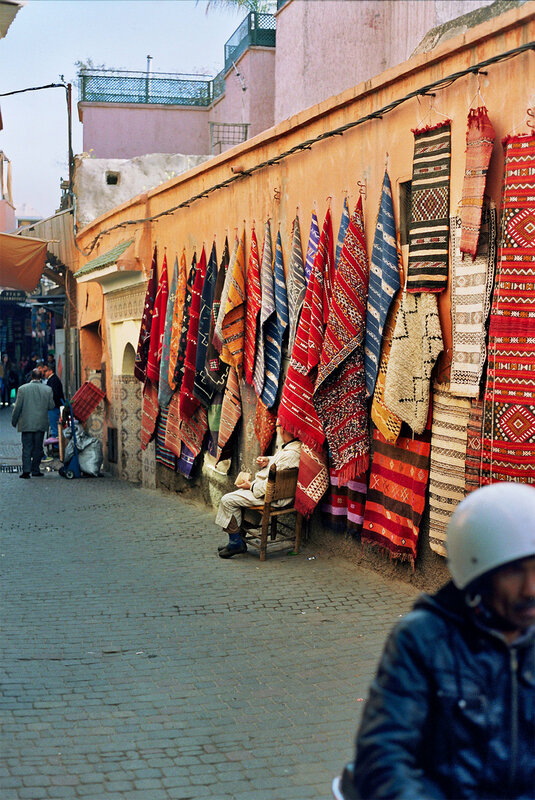 I only took my Leica to Morocco and 2 packets of Portra 400. I am obsessed with people. I do apologise to those who rave on about wildlife photography but a bird only has one expression. It can't exactly move it's beak in a hundred different ways whereas a human can change it's face in a number of ways. Morocco was great and challenging at the same time trying to shoot portraits. A lot of people were not keen but when there was somebody who had game, it was perfect. I spoke to everyone. I now know a ton about Moroccan spices, meat, and how their plates are made. Also I spoke with carpenters, taxi drivers, Berber villagers, coffee shop owners. The list goes on. As a photographer, I am very confident and I love just throwing my lens in any direction. Not a great idea in Morocco but I googled how to behave sensibly with a photo-taking mechanism around my neck. I didn't get into too much trouble. I hope I didn't anyway. I don't really know what to say about my pictures. I'm not going to be one of the keen photographers and explain why I shot something in a certain way or how something represents something. I did an interview when I was 18 with my Paris work and I just shudder every time I read it. It's a comedy to me now. I am disorganised and I only take pictures of what I like. I just think "Yeah, that looks really cool" and just take a picture. If I see someone I like, I just run after them or approach the individual. I chat to them for a bit, compliment an item of their clothing or something interesting about them and then ask for a photo. It works a lot of the time. I like to think that taking a good portrait is just finding a great subject and taking a picture of them in their most comfortable state. I like making people laugh. That always helps. Being quirky has helped quite a bit in photography. If you're dead serious, you can come off as slightly intimidating I find. No one is keen on intimidating people really, are they? The Atlas Mountains were incredible. I think that's where I shot the most film on the trip. I was obsessed with the layering in the landscapes and the colours. A lot of warm colours. Oranges, reds and yellows. Perfect for Portra 400. My camera must have been knackered and I my right hand was like jelly. I also saw how Argan oil was made and took a portrait of one the Berber villages grinding the nut. No, that's not a euphemism. She asked me to sit down and have a good old grind but I'm a tall fella and my legs were too long to fit in to the cramped seat. This was then followed by a lunch cooked by a Berber villager where the food was amazing. Pumpkin soup, followed by Chicken Tagine finished off with Moroccan oranges smothered in cinnamon and sugar. Bloody fantastic. My dad also came on the trip with me which was fun. We're both very similar personality-wise so we just ended up speaking to everyone. Also my mum was great and surprised me with the flights for christmas. My parents are both into their art and photography so my dad became so entranced with photography. We all buy photography books for each other at christmas. It sounds really pretentious but we are a family obsessed with photography and art. I was obsessed with vehicles, colours, landscapes and the culture in Morocco also. It's obvious by looking through my negatives. I loved how unclean and natural the city was. I can't stand modern buildings. They're too clean and lack character. It slightly irritates me, so Morocco was perfect. I didn't appreciate monkeys dressed up as Messi and serpents being thrown my neck like a necklace. But I did laugh a lot. I was also offered a job working in the Souks selling spices but I don't think my job back in the UK would appreciate me leaving so I could sell cold remedies in the form of herbs in an intense market. Being able to speak French really helped with interacting with people too. It made it much easier to make them feel comfortable when taking a picture. I wanted a controversial picture from deep in the Souks to show the problems of the animal trade. I was rejected twice. Once by a fella selling rare lizards. Another by a guy with a crocodile skin. But my last subject was great and let me take a picture of him standing under his snake skin that he was bizarrely very proud of. It was so dark in the markets so I was happy that it came out. I am really stingey with my film and refuse to shoot 2 exposures for a subject. I just pray it comes out. I am trying to think of a theme of how I can present my pictures on Biancissimo but I have no idea. I'll just display the pictures that made me cheer when I saw them for the first time in my cramped studio in Liverpool where I must have sounded like a lunatic to my neighbours. I'm ok with that. I'm sure they would have bounced around the room like a football too. Maybe. Lord knows. Every roll had a little diamond in it. To be quite frank, I didn't know people would get so excited to see my Morocco work and the response has been amazing. I am in the works of making a book and lord knows how to do that. I want to make something special though. I would also like to thank anyone everyone that bought a print over the years. You got me through a law degree you generous individual. You payed for my foreign coffee.